Recent release “Bunnsville Buzz The Adventures of Bessie Bunny” from Page Publishing author Karen Bunney is a sweet and lighthearted tale about a bunny who keeps trying despite any difficulties she may face. Karen Bunney has completed her new book, “Bunnsville Buzz The Adventures of Bessie Bunny”: the light-hearted story of a bunny struggling to cope with being born with big ears and feet. Although Bessie Bunny uses a wheelchair, she does not allow her physical limitations to hinder her from pursuing her interests. She enjoys the same activities as her peers and maintains a sunny demeanor. When pondering about her differences, Bessie’s mother explains that she has an important purpose in this life. 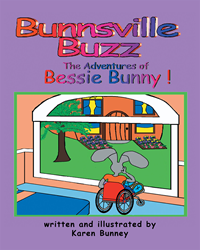 Published by New York City-based Page Publishing, Karen Bunney’s “Bunnsville Buzz The Adventures of Bessie Bunny” is a heartwarming tale of a resilient bunny who tackles major obstacles without complaining while also facing her physical differences head-on. Inspired by the author’s own experience of being born with cerebral palsy, Bessie Bunny is determined to live her life to the best of her abilities. Bessie Bunny enjoys socializing with other bunnies at a cafe, playing tennis, and reading at the library. Whether it's trying out for basketball or tennis, Bessie never lets anything slow her down! Readers who wish to experience this inspiring work can purchase “Bunnsville Buzz The Adventures of Bessie Bunny” at bookstores everywhere, or online at the Apple iTunes store, Amazon, Google Play or Barnes and Noble.